A Christmas Eve party post, yes it’s late, but that’s what happens when you head off camping on Boxing Day and don’t return for nearly three weeks. Christmas Eve is Hubby’s birthday, we never plan a party but it always seems to happen. It used to be a VERY late one, with lots of drinking and no kids present at all, but how times change! Most of the crowd leave by 9pm, to set out food for Santa and his Reindeer and tuck the littlies into bed. This year I decided to make the party about the kids too, and keep them occupied a little. I originally saw the amazing idea of a Reindeer Food Buffet over at Enjoying the Small Things which is one of my favorite places to visit (if you haven’t already paid her a visit, then you must, like now!). 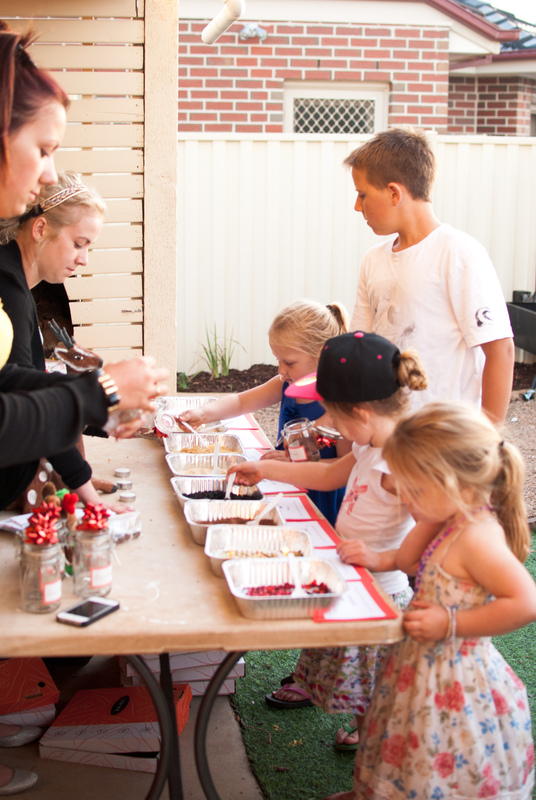 Kelle has held her North Pole party the last two years and simply put is nothing short of amazing and magical! Mine was unfortunately nothing like hers, but I had a crack and the kids loved every minute (even the big ones). 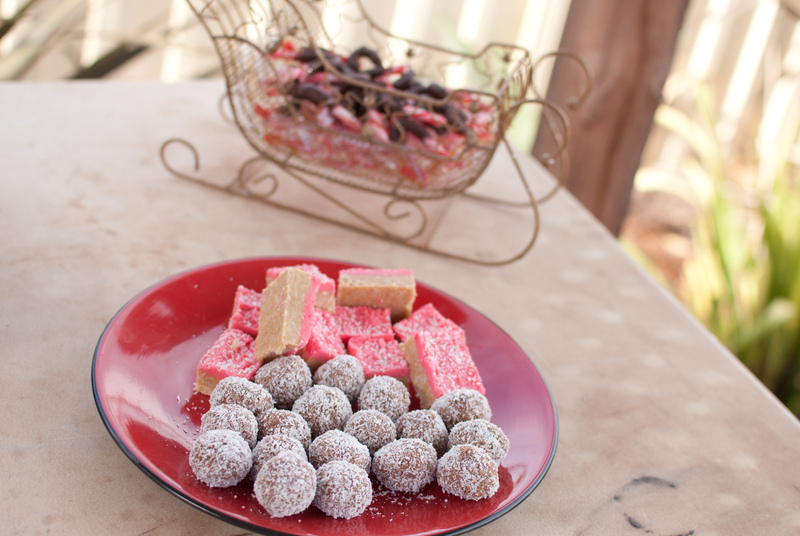 Before making anything, there needed to be some snacks, of the naughty kind of course! 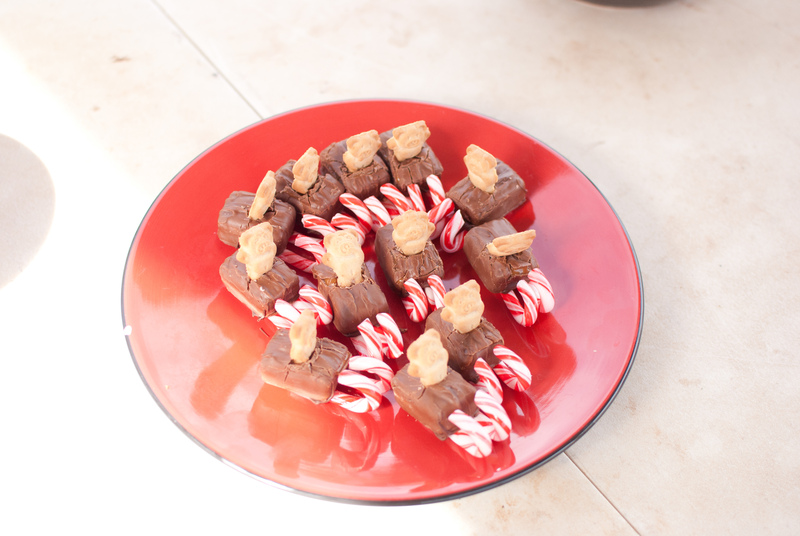 A few things were of inspired by Pinterest, including choc-dipped candy canes, the teddy bear sleighs, as well as glasses of chocolate milk to wash everything down. 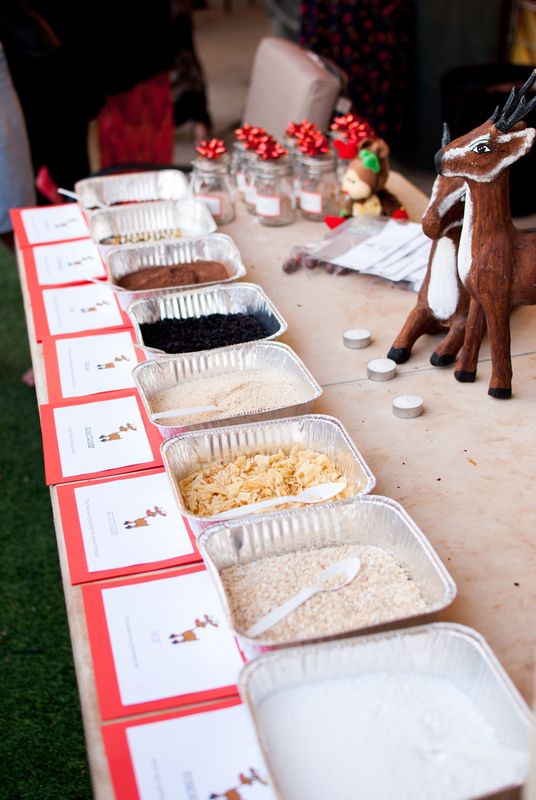 And then there was the Reindeer Food Buffet itself. 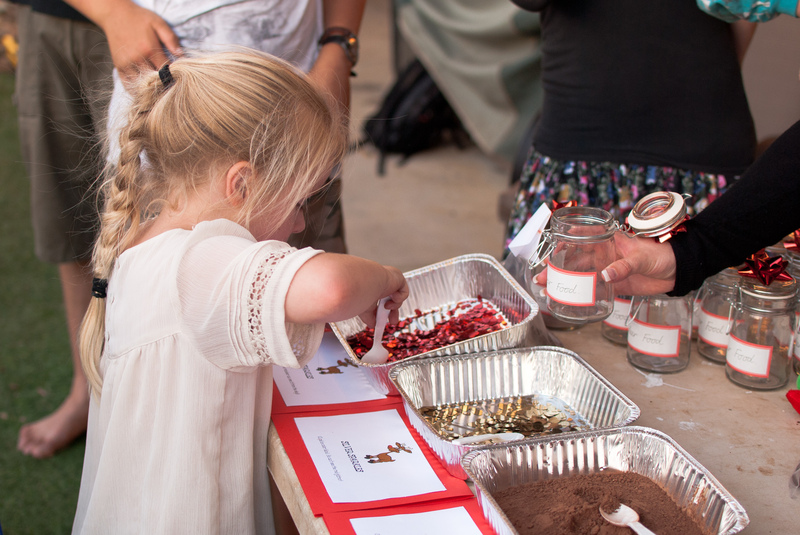 Complete with jars to take home and scatter their personally made reindeer food on the front lawn. Make sure you head over to here, to get Kelle’s labels, each explaining the ingredients and what they are for. I set up the buffet using disposable tin-trays that housed all of the ingredients and then printed my own labels based on Kelle’s. I had a couple of adults helping the younger kids while I took some photos. 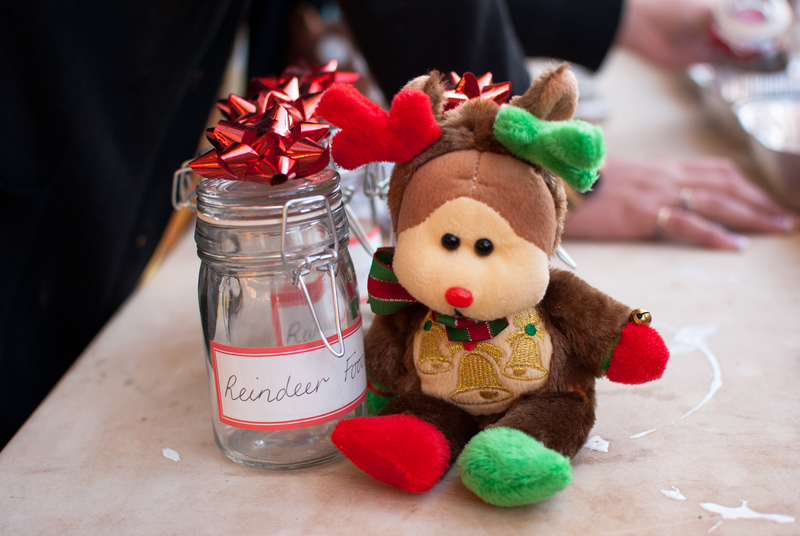 Kids also took home a lolly bag of reindeer noses (I’m sure lots of you saw them on Pinterest over the festive season!). Next year I’m sure they’ll all be fine doing it themselves (oh my god, did I just say next year?). Although there was a bit of preparation involved, everything ran smoothly. The kids loved the buffet and many of the adults were quite impressed and enjoyed watching the kids too. Hubby loved the fact that his birthday wasn’t just about him, but about the upcoming arrival of Santa. A few weeks back I wrote this post, about making presents. Lots a people thought it was a great idea, and since then, one Mum and pretty girl have tried it out. They loved it and it worked a treat! So here is the recipe, which I sourced originally from here. I just played around with the quantities to make enough to put in the jars, to make it a thick enough to paint and not drip everywhere. I found it easier to mix the ingredients with a whisk, it was definitely less lumpy this way. Using some carboard, paint a masterpiece! Don’t use the paint in big blobs thought! Place your masterpiece in the microwave for 10-10 seconds. This will make the magic happen! I play to make some more for Phoebe to play with over the holidays. 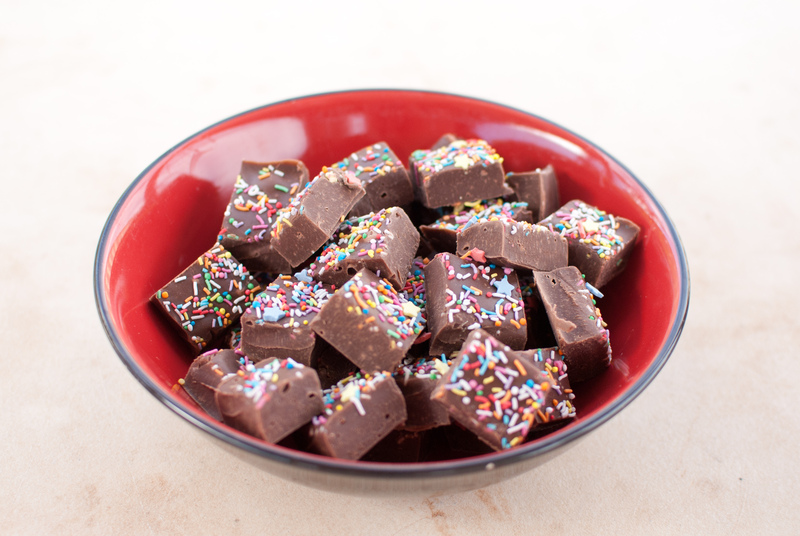 If you make some, let me know how you go and if the kids enjoyed it! 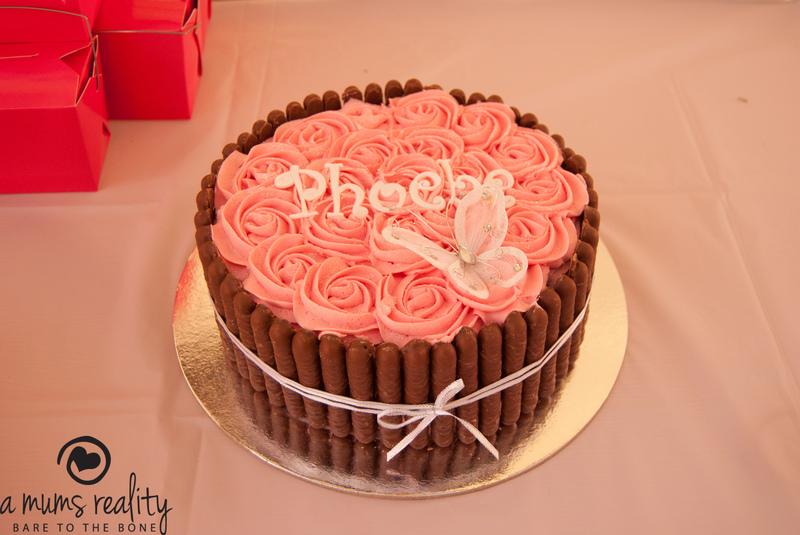 With a big family (on Hubby’s side anyway), Phoebe’s birthday is always a big celebration. I always try to have a little party for her though, with a couple of our close friends kids. 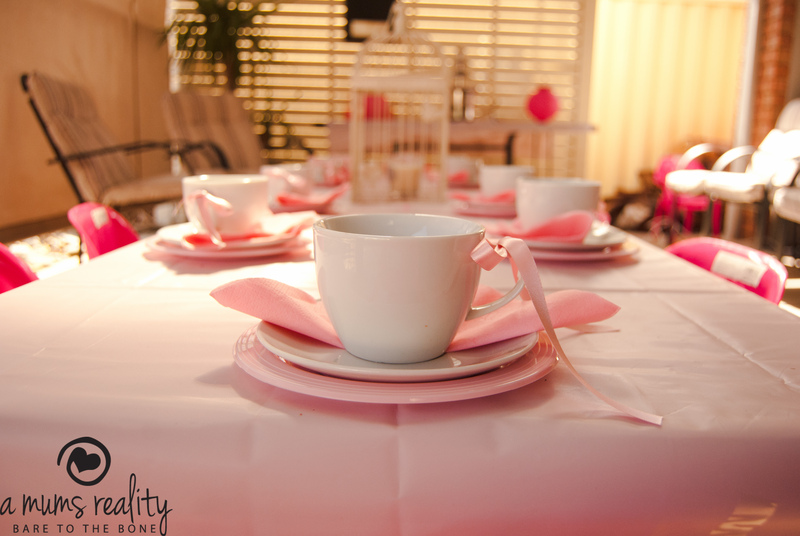 To minimise numbers even more this year, Phoebe decided on a girls only tea party. Love! Pink was also a big theme. I’m not sure exactly when it became her favourite colour but for her it was a must. Teacups and Teapots sourced from the local Kmart. I did try op shops for some nice vintage looking ones, but man they were expensive. The beautiful birthday girl. 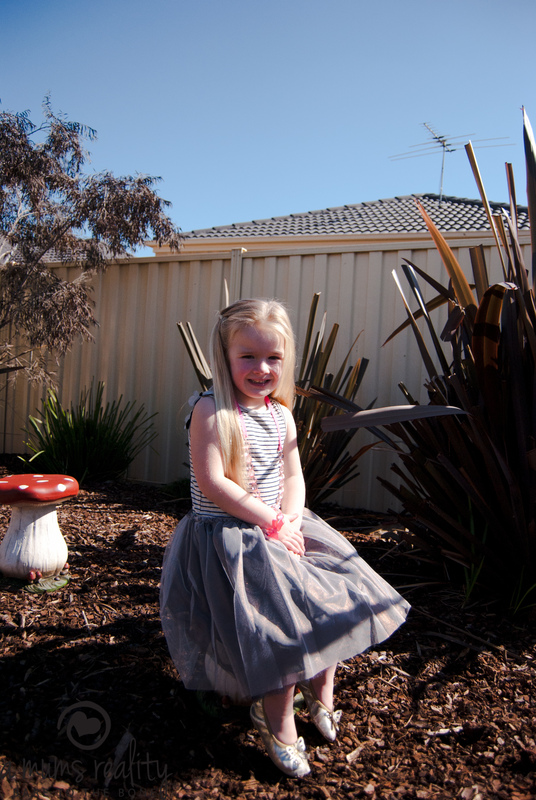 The toadstools were great, as each child arrived, they sat over here with Phoebe and had a photo. And the spread! 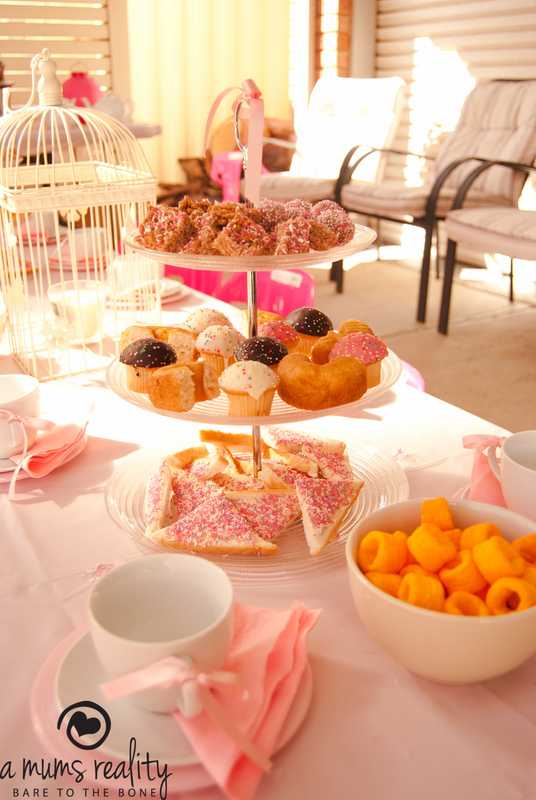 Afternoon tea for the girls, including pink lemonade and lots of delicious sweets (the Mum’s had to taste test aswell). 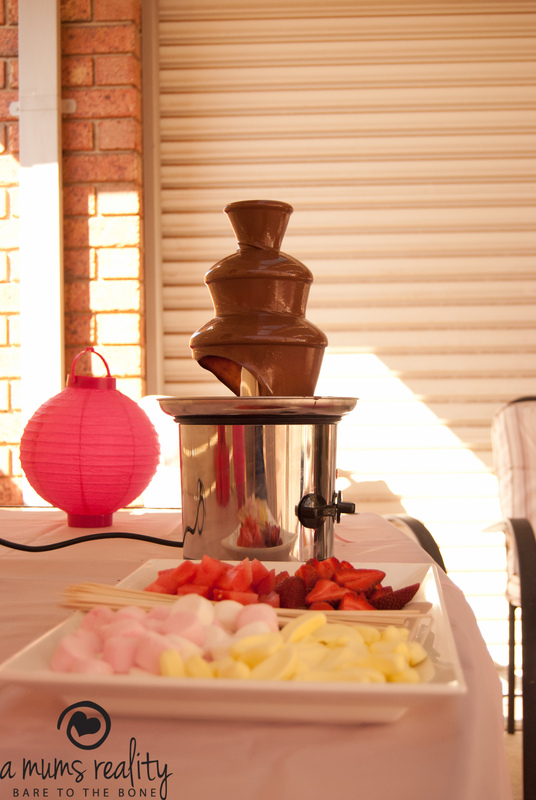 And what’s a party without a chocolate fountain? It was a big hit with the girls (and their faces and dresses). The fruit went quicker than the lollies, very impressive. And the beautiful, scrumptious cake, which I wish I could say I made. Cake, CJ Sweet Treats (she also makes beautiful macarons). Even though it was a huge and tiring weekend, the main thing was that Phoebe had a wonderful time with her close friends AND the sun was shining, what a great day for a tea party outside! My husband at the moment thinks I am one big tight arse! Now I’m starting to wonder if I possibly am. This week sees Phoebe attend no less than about 7 birthday parties, mind you, this is not including her own. The fact that I have to buy my baby girl a present and put on a little shindig for her, already means the budget is tight. I am the present buyer in this house you see, and I think that hubby sometimes forgets that I only work part-time. So this year (ok month), I’m tryng something different. I’m trawling the internet and pinning my heart out over at Pinerest, head over and see this board in particular. Most the kids who I’ll be buying for have heaps of toys (compared to Phoebe who never really has had alot, she prefers her dolls, dress ups and playing in the garden) and I’m really at a loss as to what get them, truly I am! It’s not just about the money, although that is a factor, seriously what do I get some of these kids? I’m going the homemade option this month, I want to see how it goes. I’m trying to make things the kids will like and then pretty them up a bit. I’m hoping some of the Mum’s give me honest feedback, if you think they are crap, please tell me, if you love the idea, tell me that too. These are the gifts for Round One. 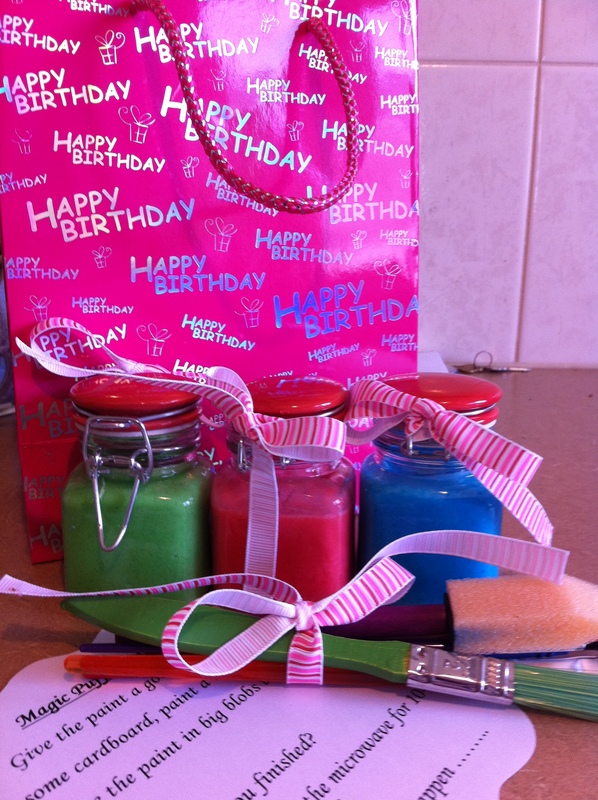 They are jars with homemade puff paint along with some instructions. The kids paint their own picture on some card, then it gets microwaved for a few seconds and just like magic, the paint rises and creates texture. I included some coloured paper in one, but for the second I changed my mind and added in some brushes instead. Phoebe loves it and tested it out, so hopefully the other kids will too.